Also called bio-agent, biological threat agent, biological warfare agent, biological weapon, or bioweapon — is a bacterium, virus, protozoan, parasite, or fungus that can be used purposefully as a weapon in bioterrorism or biological warfare (BW). In addition to these living and/or replicating pathogens, biological toxins are also included among the bio- agents. More than 1,200 different kinds of potentially weaponizable bio-agents have been described and studied to date. Biological agents have the ability to adversely affect human health in a variety of ways, ranging from relatively mild allergic reactions to serious medical conditions, including death. Many of these organisms are ubiquitous in the natural environment where they are found in water, soil, plants, or animals. Bio-agents may be amenable to "weaponization" to render them easier to deploy or disseminate. Genetic modification may enhance their incapacitating or lethal properties, or render them impervious to conventional treatments or preventives. Since many bio-agents reproduce rapidly and require minimal resources for propagation, they are also a potential danger in a wide variety of occupational settings. The Biological Weapons Convention (1972) is an international treaty banning the use or stockpiling of bio- agents; it currently has 165 state signatories. Bio-agents are, however, widely studied for defensive purposes under various biosafety levels and within biocontainment facilities throughout the world. In 2008, according to a U.S. Congressional Research Service report, China, Cuba, Egypt, Iran, Israel, North Korea, Russia, Syria and Taiwan were considered, with varying degrees of certainty, to be maintaining bio-agents in an offensive BW program capacity. 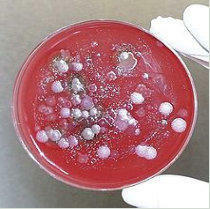 A culture of Bacillus anthracis- the Anthrax Bacillus.